100 point Observation form: Observing and evaluating Rocket Math during practice–a must for principals who want Rocket Math to run effectively in their schools. NEW!! Find out if your staff knows how to implement Rocket Math so it works well! Rocket Math Fact Fluency Benchmarks: Here are some recommended benchmarks for math fact fluency to use with the Common Core State Standards. Rocket Math 2015 Individual Student Graph. An adjustable graph on which to record the results of the 2-minute progress monitoring timings. Start the vertical axis of the graph where the student begins at the start of the year and there will be enough room for the year’s growth. Here’s a link to a blog about how to fill in the variable vertical axis. Individual Student Rocket Math Progress Aimlines. If you indicate on this graph the week in which the student finishes each set in Rocket Math you can tell if the student is making enough progress, or if he/she needs to be getting extra practice sessions each day. If the student is working on a set above the line of gray boxes or on the line then progress is adequate. Below the line means he/she needs intervention. Here is a link for an aimline to finish two operations in a year . This link is for the aimline to finish one operation per year. Whole Class Rocket Math Aimline in Excel. See the example to the right. There are two excel files that you can use to keep track of student progress doing Rocket Math. The purpose of these files are to identify students who need to get extra practice sessions during the day. In the example there are three students who aren’t making enough progress and need more practice sessions daily. (If the fraction of students making expected progress falls below 70% I’d recommend giving the whole class two practice sessions a day.) The students aren’t making enough progress to meet the expectations. The pictured example is in a grade level where a second operation should reach mastery–2nd grade where Addition and Subtraction should be completed, and 4th grade and above where Multiplication and Division should be mastered during the year. This is the link for the Excel Aimline for Two Operations in a year. And then here is the link for the Excel Aimline for One operation in a year, first grade for Addition and third grade for Multiplication. Here is a link to the EXAMPLE Rocket Math Excel Aimline which shows how to fill it out (partially shown to the right). Here is a copy of the basic parent letter from you the teacher to parents as a Word documents so you can edit it and make it your own. Queridos Padres — parents letter in Spanish. Read this blog on the topic of the best sequence for Rocket Math. (download the graphic for yourself). Number Writing Practice page Q4 from Rocket Writing for Numerals In case you wish to see if your students need more numeral writing practice or if they are ready for Rocket Math, or if you want to give them some warm-up practice. Handouts for Training DVD. 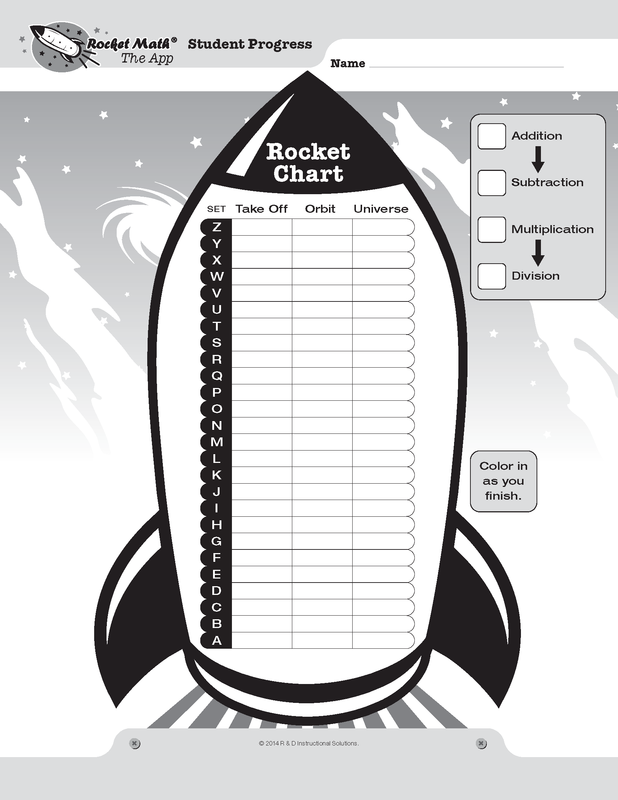 Here are the handouts you will want to use to follow along with the training DVD to learn how to use the original, worksheet-based Rocket Math curriculum. BY POPULAR DEMAND! The Teacher-Student game. Explains the best classroom management technique we’ve ever seen.